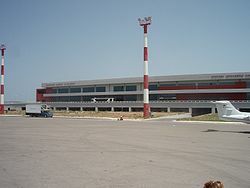 Zakynthos International Airport "Dionysios Solomos" (IATA: ZTH, ICAO: LGZA) is an airport in Zakynthos, Greece. In December 2015 the privatisation of Zakynthos International Airport and 13 other regional airports of Greece was finalised with the signing of the agreement between the Fraport AG/Copelouzos Group joint venture and the state privatisation fund. "We signed the deal today," the head of Greece's privatisation agency HRADF, Stergios Pitsiorlas, told Reuters. According to the agreement, the joint venture will operate the 14 airports (including Zakynthos International Airport) for 40 years from 11 April 2017. The airport is close to the town and beach of Kalamaki. Kalamaki beach is part of the National Marine Park of Zakynthos. The endangered loggerhead sea turtles (Caretta caretta) lay their eggs at the beaches of the marine park at night during the summer months. This has resulted in aircraft movement restrictions. Flights are not permitted to take off or land between 10:00PM to 5:00AM. It is at the jurisdiction of the Greek authorities to allow aircraft movements at night under extenuating circumstances. The airport opened in 1972. An expansion of the airport's apron area to 35,100 m² was completed in 2003, and a new 22,150 m² terminal building was completed in 2008. The airport is 4.3 km from Zakynthos town and other seaside tourist destinations such as Laganas, Tsilivi and Kalamaki. The main approach into the airport is Runway 34. Aircraft usually have to fly over Laganas bay and make a 180-degree turn, before their final approach over sunbathing tourists on the busy Kalamaki beach. On 22 March 2017, Fraport-Greece presented its master plan for the 14 regional airports, including the Zakynthos International Airport. Improving lighting, marking of airside areas. 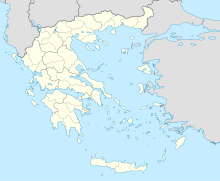 ^ "Greece signs privatization of 14 regional airports with Germany's Fraport - TornosNews.gr". Retrieved 4 May 2017. ^ Editorial, Reuters. "REFILE-UPDATE 1-Greece signs major privatisation deal with Germany's Fraport". Retrieved 4 May 2017. ^ "Fraport Greece Begins 40-Year Concession at 14 Greek Regional Airports - Fraport Greece". www.fraport-greece.com. Retrieved 4 May 2017. ^ 2017, UBM (UK) Ltd. "British Airways adds new Heathrow – Europe routes in S17". Retrieved 4 May 2017. ^ "20% More Holiday Destinations: Edelweiss to Massively Expand Its Route Network in Summer 2018". Retrieved 20 September 2017. ^ a b "Charter flights". Retrieved 4 September 2018. ^ 2017, UBM (UK) Ltd. "Eurowings adds new routes to Cyprus/Greece in S17". Retrieved 4 May 2017. ^ 2017, UBM (UK) Ltd. "Finnair Adds New European Routes in S16". Routesonline. Retrieved 4 May 2017. ^ "Flight". apollo.no. Retrieved 9 October 2018. ^ "Flight". apollo.se. Retrieved 9 October 2018. ^ "Charter flights". charterflights.r.pl. Retrieved 4 September 2018. ^ 2017, UBM (UK) Ltd. "Smartwings S17 new routes as of 15DEC16". Retrieved 4 May 2017. ^ 2017, UBM (UK) Ltd. "Thomson outlines planned new routes in S17". Retrieved 4 May 2017. ^ 2017, UBM (UK) Ltd. "Volotea S17 New routes as of 14OCT16". Retrieved 4 May 2017. Airport information for LGZA at World Aero Data. Data current as of October 2006. This page was last edited on 11 April 2019, at 00:39 (UTC).